Heartburn is a global public health problem that causes considerable suffering. The company Implantica is developing an implant and a surgical tool that provides revolutionary treatment. Globally, an estimated 400 million people suffer from gastroesophageal reflux disease (GERD). This chronic disease entails the leakage of stomach contents up to the esophagus due to insufficient closure of the upper orifice of the stomach. The symptoms are heartburn and chest pain, but about 15 percent of those inflicted also develop precancerous changes to the esophagus. The most common GERD treatment is with acid inhibiting pharmaceuticals, know as PPI (Proton Pump Inhibitors). To provide lasting treatment that eliminates the need for medication, Implantica has developed the passive implant RefluxStop. The implant consists of a small silicon ball that is divided into five parts. 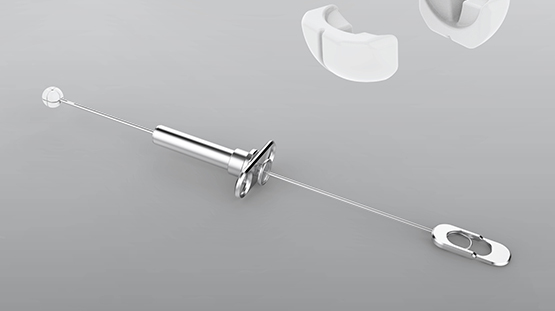 With the help of the specially developed Reflux Deployment Tool, the implant is compressed before insertion via a keyhole operation. It is subsequently expanded again, once it is in place. 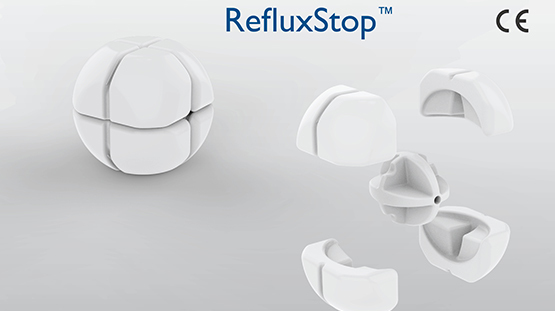 The goal of RefluxStop is to replace the current, relatively complicated surgical method in which tissue from the stomach is wrapped around the lower part of the esophagus to compress the passage. This operation can help patients but the results vary. The risk for complications is also considerable. As an example, those who undergo the operation can have problems with swallowing, burping or vomiting. Even in earlier development projects, Implantica has engaged consultants from Prevas and its network. On two current projects – development of the RefluxStop implant and the surgical instrument Reflux Deployment Tool – more than 50 consultants have been involved. They have contributed with expertise in among other things, project management, mechanical design, quality assurance and regulatory documentation. Moreover, a larger number of subcontractors and test labs in Sweden, Europe and the US have contributed with their services. Several professions have been involved in both projects. It has therefore been important to create a common understanding of the regulations and demands that apply to development of life science equipment. Prevas has many years of experience in life science and is also certified in accordance with ISO 13485 – quality management for development of medico-classified products. For the engineers, it is also a matter of compliance with the conditions for surgical devices. That the implant must be possible to insert in a way that works both for patients and surgeons. All in all, a complexity that entails that the conditions can rapidly change while an operation is underway. The implant and the surgical instrument is now CE-labelled. Production is also being adapted for scaling up, subsequently requiring new, supplemental validations and tests, such as with regard to bio-combability and sterility. The goal is for the implant and surgical instrument to reach the market during 2019. The global need is estimated at 2.2. million procedures each year.